The kit has three parts - a cleanser, an exfoliant (kind of like a toner), and a blemish treatment. My routine is that I remove my eye makeup with coconut oil, and then wash my face with the cleanser. After drying my face, I dab on the exfoliant to problem areas with a cotton swab, and wait about 30 seconds for my skin to dry. Then I rub in the blemish treatment to the same areas, wait until it has absorbed, and then follow up with my daily moisturizer. I do find that it's a bit drying on my already dry skin, so I use it only on my problem areas (for me those are my left cheek and my chin). 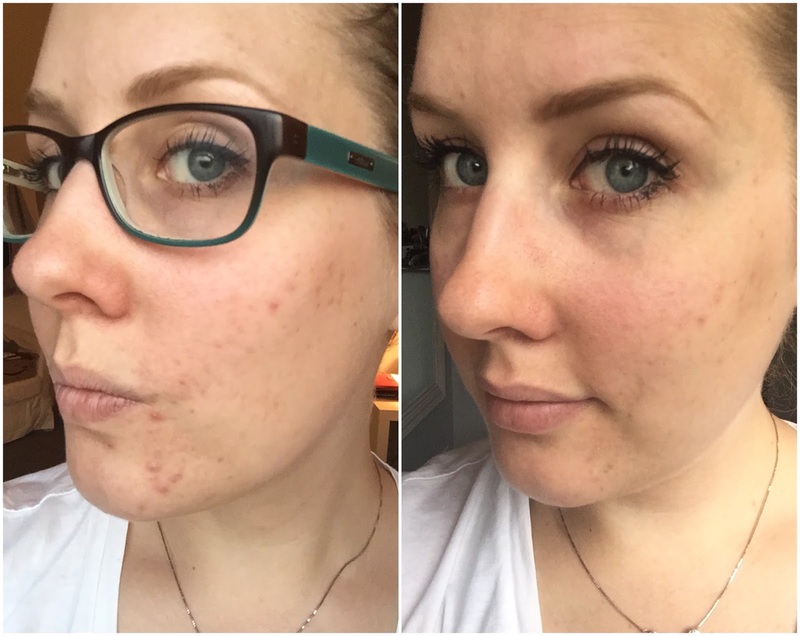 I noticed within two days that it was already making a difference in my skin - zits were smaller, and there were no new ones showing up every day. 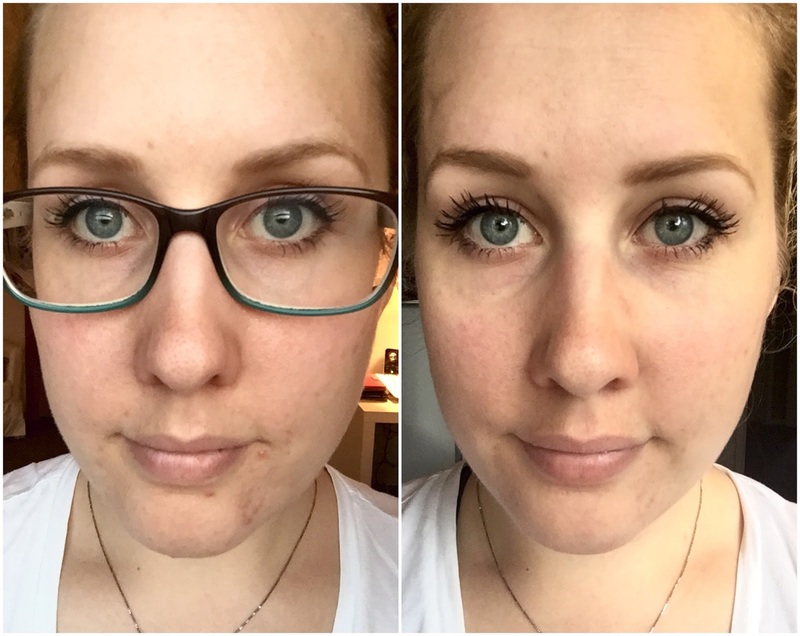 I used the product for 4 weeks straight, and then around our move, I couldn't find it for a few days in all the boxes, so I soon broke out again. I dug through the boxes to find the kit, and by the next morning, no more zits. I was seriously shocked how quickly it worked. I wanted to wait at least a full month before doing a review, mostly because I wanted to see how everything panned out with the usual hormonal acne. Well, it's been 6 weeks, and it's nothing short of a miracle, because absolutely nothing happened. So, here the before and after pictures in all their zitty and non-zitty glory. I'm not wearing any face make up in either picture. I'm honestly so impressed with this kit, and will definitely be re-purchasing in the future. Although the bottles are fairly small for a $50 system, I do think that this purchase will last me to close to the end of the year. Now that my acne has cleared up, I'm alternating nights between the acne system and the Kiehl's Midnight Recovery oil (my review of that can be found here, if you are interested!). If you are interested but don't want to drop $50 on the full sized kit, there's also a trial size set for $13. If you try one of their products, but it doesn't work for you, Paula's Choice has a very generous return policy, so it literally can't hurt to try. This is the first time in a long time that my skin has been this clear, so I wanted to share with you guys in case any one else is struggling with adult acne. For those of you who have had good luck with Paula's Choice products, do you have any favorites? I'm looking for a good eye treatment, as well as anything that will help with acne scars because as you can see above, I'm left with a few friendly reminders.